Archery Camp registration is open now! Visit the Adventure & Outdoor Camp page for complete details! Spring/Summer Target Archery program registration is open now for Howard County residents! See the tabs below for complete details and schedules. Learn the basics of Target Archery in an Intro or Archery Together class to participate one of the archery club programs! HCRP utilizes NFAA and USArchery certified instructors, fiberglass recurve and universal draw-length compound bows. 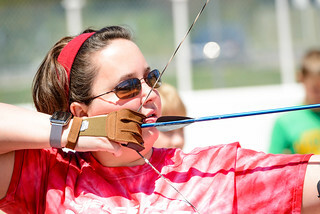 Programs focus on the mental aspects and technique of instinctive target archery. Target Archery classes are offered in the Spring and Fall*, camps available in the summer. Open Range time available during the summer - see the Open Range tab for details. (* Lil Archers programs available year round). Detailed information will be emailed to participants within a week of the program start date. Registration: 410-313-7275 or click the RP numbers to sign up online. New to archery or looking to refresh some skills? Target Archery programs start at 8 yrs & up (programs using age-appropriate equipment for younger children are available - see tabs below for more information). - Start with an introductory class like the Intro to Target Archery or Archery Together (Parent/Child), held on Saturday mornings in the Spring and Fall. - Practice your skills during Open Range times! - Want to take your skills up a notch? Sign up for the HCRP Target Archery Skills Club and work with our instructors on your personal goals (4-week sessions). - Private lessons with USA Archery-certified instructors available. Can't make a class? Schedule a lesson and sign up for Open Range time to work on your skills. Experience the sport of archery in a fun, safe and supervised environment. We use plastic arrows with rubber suction cups to teach the basics of archery. Sign up for multiple sections and watch your child's archery skills improve! No experience necessary and all equipment supplied for use during the program. Build and decorate your own PVC bow and learn techniques, form and range safety in a one-day class with our certified instructors. Don't miss these summer camp opportunities: For complete details visit the Adventure & Outdoor Camps page at www.howardcountymd.gov/adventurecamps! Experience the sport of archery in a fun, safe and supervised environment. We use plastic arrows with rubber suction cups to teach the basics of archery. No experience necessary and all equipment provided for use during the camp. Bring a non-perishable snack and beverage (no nut products). Camp will be held rain or shine. For more information, contact Matt Medicus at 410-313-1769. This is a basic level course intended for kids who are new to the sport and looking for a positive experience with archery. During the camp, archers become proficient in shooting a bow and receive instruction in archery essentials such as range safety, equipment maintenance, self-analysis and archery etiquette. Additional activities include history of archery, fun shoots (balloon shoots, etc) and a competition on the last day. Bring a non-perishable snack and beverage (no nut products). Schedule is subject to change. Fee includes supervision, equipment and activities. For more information, contact Matt Medicus at 410-313-1769. Discover the basics of archery in this one-day class! Learn basic techniques and form using recurve and compound bows from an USA Archery-certified instructor. Equipment, safety and elements of shooting are covered. Course meets the requirement to participate in the HCRP Archery Clubs. You and your child learn the basic techniques of archery together! Equipment provided for use during the class; safety and elements of shooting are covered by an USA Archery-certified instructor. Course meets the requirement to participate in the HCRP Archery Clubs. Focus on refining target archery technique though practice and self-paced development with our USA Archery-certified instructors. Parents are welcome to sign up with their children during youth sessions! Program is four weeks, start dates listed below. Participants must have completed* an HCRP introductory target archery class prior to the start of their Archery Club session (Introduction to Archery, Archery Together, Archery Camp, Archery & Paddling Camp or Archery & Fishing Camp). Open Range Time also available on select dates - click on the Open Range tab for more details! * Archery Club sessions may fill quickly. You may register for an Archery Club session at the same time you register for an introductory class, just as long as you will have completed the class before actually participating in the Club session. However, understand that you may not be eligible for a full refund from a Club session if you are not able to attend the intro class. A sampling of 2019 archery camps. Many Adventure & Outdoor Camps include a target archery component; for complete details visit the Adventure & Outdoor Camps page at www.howardcountymd.gov/adventurecamps! Many Adventure & Outdoor Camps include archery, including the popular Archery & Fishing Camp and Archery & Paddling Camp! Visit the Adventure & Outdoor Camps page for complete details! The Alpha Ridge Archery Range is open for drop in use. Sign up for an Open Range Pass each season for unlimited use on select dates and times! $50 fee allows access at any or all of the Open Range times during that season and includes the use of HCRP equipment while at the range*. Or pay $30 and bring your own equipment. Targets provided. Prior completion of a Recreation & Parks' Intro program is encouraged but not required to use the range. Archers must be able to participate in a safe and proper manner and follow range rules and staff directions at all times. Call 410-313-7275 to register, or click the RP numbers below to sign up online. Info: Matt Medicus, 410-313-1769. * You must have completed a Howard County Recreation & Parks Introductory course (Intro to Archery, Archery Together or Archery Camp) to use HCRP equipment. A basic orientation will be completed at your first visit to the range. To use HCRP equipment, you MUST have completed a Howard County Recreation & Parks Introductory course (Intro to Archery, Archery Together, Archery Camp). This range is supervised. Archers must follow range rules and directions of staff at all times or range use may be suspended without a refund. Target or field points only, no broadheads. No crossbows. Range staff reserve the right to refuse the use of any equipment deemed inappropriate for this location. This is not an instructional program. Under 16 must be accompanied by an adult that is also registered and participating, or if not participating must remain in the archery spectator area. Range time and equipment use is on a first come, first serve basis. BLOCK targets provided. Archers may bring their own 10-ring or spot paper targets for personal use, but please be sure they are family-friendly (NO humanoid or animal forms/shapes). All archers should check the program status line at 410-313-4451 (option 1 then option 4) before heading to the range. There are several factors that may cause the range to close, not just the weather. There are no refunds or makeups for missed or canceled sessions. Only registered Range Pass users will be allowed on the Alpha Ridge Archery Range. Archery is not permitted on an individual basis on any Howard County Recreation & Parks property. If a program is full, place your name on the Wait List! There is no charge, and you can sign up on the Wait List online or by phone (410-313-7275). Wait List customers are considered first should a spot become available or additional sections be added. All participants should check the program status line within ONE HOUR of their program start time, regardless of the weather. There are a lot of status lines for Recreation & Parks - the correct status line for target archery programs is 410-313-4451: Press option 1, then option 4. (Camps are not on this line - please consult your camp information for updates). There are many reasons a program may be cancelled, not just weather, so please consult the program status line before each session.